Adipokines may be important in mediating signals from adipocytes to insulin-sensitive tissue and vasculature. We studied the effect of different glucose-lowering therapies on serum levels of plasminogen activator inhibitor-1 (PAI-1), high-sensitivity C-reactive protein (hs-CRP), TNF-α, leptin, adiponectin and ghrelin in patients with type 2 diabetes. Twenty-eight patients with poorly controlled type 2 diabetes who were receiving oral hypoglycaemic agents were allocated to one of the following groups, and treated for 1 year: (1) lifestyle intervention (L); (2) insulin treatment (I); and (3) combined treatment (L+I). Similar improvements in glycaemic control occurred in all three groups. There was a reduction in body weight of 3.0 kg (median) (95% CI −5.9 to −2.0) in group L, whereas in groups L+I and I body weight increased by 3.5 kg (95% CI 1.5–4.9) and 4.9 kg (95% CI −3.1 to 8.2), respectively. By trend analyses, group L had reduced levels of PAI-1 (p=0.002), hs-CRP (p<0.0001) and TNF-α (p=0.006), while no significant changes were observed in the levels of leptin or adiponectin. In group I, the median levels of PAI-1 (p=0.008), TNF-α (p=0.058) and leptin (p=0.004) increased. In the L+I group there was a reduction in PAI-1 levels (p=0.014) and an increase in levels of leptin (p<0.001). The differences in changes in the levels of PAI-1, hs-CRP, TNF-α and leptin between groups were also significant (all p<0.01). Improvement of glycaemic control through lifestyle intervention in type 2 diabetes had more beneficial effects on adipokine levels than when the same lowering of HbA1c was achieved with insulin treatment. Several adipokines have been identified that relate inflammation and impaired fibrinolysis to diabetes, obesity and cardiovascular disease [1, 2]. Insulin resistance has been considered central in the pathophysiological processes behind the metabolic syndrome; however, recent literature suggests that inflammation, secondary to genetic predisposition and modified by environmental stimuli, may be a probable proximate cause for the development of insulin resistance . Population studies have shown strong associations between indices of inflammation, abnormal lipid and carbohydrate metabolism, obesity and insulin resistance [4, 5, 6, 7, 8]. In a cross-sectional study of 822 young men and women , obesity was independently related to C-reactive protein (CRP), with a 3–7% increase in mean CRP levels for each unit (kg/m2) increase in BMI. Several adipokines act either as independent risk factors, or as combined risk factors. A strong positive correlation between both circulating and adipose tissue levels of TNF-α, leptin and high-sensitivity CRP (hs-CRP) levels has been reported, but these correlations disappeared when adjusted for fat mass . The authors concluded that there is a strong relationship between adipocytokines and inflammatory markers, suggesting that cytokines secreted by adipose tissue in obese subjects play a role in the increased secretion of inflammatory proteins by the liver. Subclinical inflammation has been shown to precede the onset of type 2 diabetes [9, 10, 11, 12] and increase the risk of CHD [13, 14, 15, 16]. Long-term insulin treatment of type 2 diabetic subjects is typically accompanied by a weight gain of 4–5 kg during the first year of treatment [17, 18, 19]. This side-effect might counteract several of the positive effects of the insulin-mediated decrease in plasma levels of glucose, and this may be one of the reasons why insulin therapy has not proven effective in reducing morbidity or mortality of cardiovascular disease in type 2 diabetes . 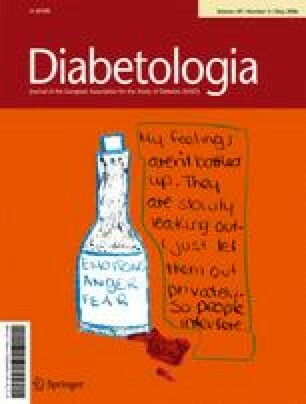 In patients with type 2 diabetes, lifestyle intervention has shown beneficial effects on traditional risk factors for cardiovascular disease, such as plasma glucose, blood lipids and blood pressure, although the effect may be modest and transient [21, 22, 23, 24, 25, 26, 27, 28, 29, 30, 31]. The evidence for an association between glycaemic control and systemic inflammation in subjects with diabetes seems conflicting [32, 33, 34, 35]. The purpose of the present study was to determine the effect on adipokines of lowering blood glucose through lifestyle intervention or through insulin therapy in initially poorly controlled type 2 diabetic patients. Details of study design, methods and major outcomes of the study on blood glucose and lipid levels and body composition have previously been published . The analyses we report herein were conducted to further elucidate the hypothesis generated by the primary results of the study. The patients had a clinical diagnosis of type 2 diabetes and a fasting C-peptide concentration >0.7 nmol/l and were anti-GAD negative. Eligible subjects completed a consent form approved by the regional ethics committee and were randomly allocated to one of the following three intervention groups: (1) lifestyle intervention (L), (2) insulin treatment (I) and (3) combined treatment (L+I). Ten of the 38 randomised subjects were not able to complete the study due to non-compliance (six subjects) or illness interfering with participation in the lifestyle intervention program (four subjects). The dropout rates were similar in the three treatment groups. The subjects who did not complete the study did not differ in changes in weight and HbA1c during the run-in period, age or duration of diabetes. Since the purpose of this particular study was to investigate the effect of the different treatment options on adipokines, only the subjects who completed the study per protocol were included. The current analyses are made on fasting blood samples collected every third month from the 28 patients who completed the study: nine, ten and nine in the L, L+I and I groups, respectively. The baseline characteristics of the subjects are given in Table 1. Before entering the study all subjects were treated with maximal tolerated doses of sulfonylurea (SU) and metformin and the blood levels of HbA1c were 8.0–10.5%. Subjects in group I and L+I received insulin treatment at the outpatient research clinic. Insulin treatment was started with two doses of 8 U NPH insulin per day, one in the morning and one at bedtime. The doses were increased one or two times weekly until treatment target was reached, and regular insulin was added if necessary. The treatment goal was HbA1c ≤7.5%, fasting and pre-prandial plasma glucose 5–8 mmol/l and post-prandial plasma glucose <10 mmol/l without hypoglycaemia. The lifestyle intervention programme focused on diet and exercise changes that were expected to produce weight loss and to improve metabolic control. The participants were given dietary advice in 14 group sessions and two individual consultations. The exercise programme consisted of group-based exercise for 1 h twice a week. The activities given were aerobic and of moderate intensity and included group exercise classes, walking, ball games and swimming. The patients in the two insulin-treated groups discontinued treatment with oral hypoglycaemic agents (OHAs) as they started insulin treatment. One person in group L reduced the dose of glibenclamide by 3.5 mg and two subjects reduced the dose of metformin by 500 mg during the study due to hypoglycaemic episodes. One person increased the metformin dose by 500 mg because of worsening in the glycaemic control. Lipid-lowering drugs were kept unchanged during the study period in all study participants. Two subjects had their antihypertensive therapy changed from alfa-methyldopa and mibefradil to lisinopril, and one subject reduced the dose of antihypertensives during the study period. All patients underwent a clinical examination including measurements of body weight in light clothes to the nearest 0.5 kg and body height to the nearest 0.5 cm. BMI was calculated by dividing body weight in kilograms by height in metres squared. Body composition was estimated at baseline and at 12 months by dual-energy X-ray absorptiometry scanning (DPX-l; Lunar Radiation, Madison, WI, USA). Blood samples were analysed for plasma glucose with the glucose oxidase method using a Glucose Analyzer II (Beckman Instruments, Fullerton, CA, USA) and HbA1c using the method Variant (Bio-Rad, Richmond, CA, USA; normal reference range 4.1–6.4%). Serum was separated and either analysed within 24 h or frozen at −40°C for later analysis. An ELISA method was used for determination of TNF-α in serum (High Sensitivity Assay from R&D Systems Europe, Abingdon, UK). The inter-assay CV was 8.5%. Serum-levels of hs-CRP were also determined by an ELISA method from DRG Instruments, Marburg, Germany (inter-assay CV 6.8%). Active plasminogen activator inhibitor-1 (PAI-1) was determined in citrate-plasma amidolytically, with a commercially available kit (SpectrolyseTM/pL; Biopool, Umeå, Sweden; inter-assay CV 4.8%). The serum levels of insulin, ghrelin (total), adiponectin and leptin were measured with RIA kits from Linco Research, Inc. (St Charles, MO, USA). C-peptide levels were determined on Immulite 2000 (Diagnostic Products Corporation, Los Angeles, CA, USA). The inter-assay CVs were 7–18% for these hormone assays. Homeostasis model assessment of beta cell function (HOMA-B) and insulin sensitivity (HOMA-S) were estimated from fasting values of plasma glucose and serum C-peptide using a computer program kindly provided by J. C. Levy (Radcliffe Infirmary, Oxford, UK) . Medians (with approximate 95% bootstrapped CIs) are used as measurements of central tendency, if not stated otherwise. To test the significance of changes from baseline to the end of the intervention within each treatment group, the Wilcoxon signed rank test was used and differences between treatment groups were compared by the use of the Kruskal–Wallis test. In the case of significant differences between groups, the Mann–Whitney test was used to find which groups differed. To test whether the trend (the data of all time-points included) was the same in the three treatment groups we used a linear mixed model. A linear mixed model was also used to test if there was a significant trend within the group during the intervention. To test whether the changes in body weight and HbA1c confounded the trends observed in the adipokines, we did additional trend analysis with changes in BMI and HbA1c and baseline BMI added as covariates in the model. Spearman’s coefficient of correlation was calculated to test correlations between variables. Two-sided p values less than 0.05 were considered statistically significant. The approximate 95% CIs for estimated median values were carried out in the statistical software S-plus 6.2 for Windows (Insightful, Seattle, WA, USA) using bootstrap and linear interpolation methods. Otherwise, statistical analyses were performed with SPSS 12.0 (SPSS, Chicago, IL, USA). There were no significant differences between groups in baseline characteristics of the patients (Table 1). The median (95% CI) levels of HbA1c were reduced in all the treatment groups, by −1.2 (−1.3, −0.4), −1.0 (−2.3, −0.5) and −1.5 (−2.9, −0.1)% in groups L, L+I and I, respectively, with no significant difference in the reduction between the groups (p=0.74). In group L weight was reduced by 3.0 (−5.9, −2.0) kg, whereas in group L+I weight increased by 3.5 (1.5, 4.9) kg and in group I there was a non-significant trend toward weight increase by 4.9 (−3.1, 8.2) kg (p=0.004 between groups). Baseline levels of anthropometric parameters and adipokines and changes observed between start and 12 months are given in Table 2. The levels of adipokines and anthropometric measurements were not different between the groups, except for levels of TNF-α, which were significantly higher in group L than in the two other groups (p=0.04). There was a significant difference between the changes in BMI and body fat between the three groups, as BMI and body fat was reduced in group L, increased significantly in group L+I and tended to increase also in group I. The changes observed in PAI-1, hs-CRP and leptin differed significantly between the groups. The median level of PAI-1 was significantly reduced in groups L and L+I and remained unchanged in group I. The median level of hs-CRP was significantly reduced in group L and remained unchanged in groups L+I and I, while leptin levels tended to decrease in the lifestyle group and increased significantly in both the insulin-treated groups. The levels of adiponectin and ghrelin did not change significantly during the study in any of the groups, and there were no differences observed between the groups. We then performed trend analyses including all the values from each three-monthly measurement in the model (Fig. 1, Table 3) and we performed the analyses again for the adipokines after adjustments for differences in baseline levels of BMI and for changes in BMI and HbA1c during the study (Table 3 and Electronic Supplementary Material [ESM] Table 1). The trend analysis confirmed a significant difference in weight changes during the study between groups (Fig. 1b). The serum levels of PAI-1 decreased in the two lifestyle intervention groups and increased in group I (Fig. 1c). The difference in trend between groups was significant (p<0.001, Table 3). The trend analysis also showed a significant reduction in the hs-CRP and TNF-α levels in group L, while there was no consistent change in group L+I. Group I showed a non-significant tendency to increase in TNF-α levels (p=0.058), but no change in hs-CRP levels (Fig. 1d,e). These differences in trends between group L and the two insulin-treated groups were significant for both hs-CRP and TNF-α. The changes in leptin levels were significantly different between the groups also by trend analysis (p<0.0001). The increase in leptin levels was evident already after 3 months of insulin treatment, while an increase in weight was observed from 6 months and beyond (Fig. 1b,f). We did not observe any consistent changes in the levels of adiponectin in any of the treatment groups during the intervention year. There was a tendency towards a reduction in ghrelin levels in group L, although the difference between the groups was not significant. When adjusted for changes in BMI during the intervention, the differences between the treatment groups regarding trends in hs-CRP, TNF-α and leptin, were less marked, but were still significant (Table 3). When change in BMI was added as a covariate in the mixed linear model, the β values that show the effect of ΔBMI on the adipokines were 0.61 (p=0.005) for hs-CRP, 0.10 (p<0.05) for TNF-α and 90.9 (p<0.001) for leptin. The difference in trend in PAI-1 between groups was not affected by the adjustment of changes in BMI (β=-0.26, p=0.77). On the other hand, when the model was adjusted for BMI at baseline, there was a significant interaction between BMI and PAI-1 (β=1.07, p=0.04, ESM Table 1), indicating a mean increase in the level of PAI-1 by 1.07 U/ml for 1 U increase in baseline BMI. This shows that baseline BMI was important for changes in plasma levels of PAI-1 during the intervention even though changes in BMI were not. Adjustments for baseline BMI did not affect the significance of the effect of treatment group on changes in any of the other adipokines, and neither did adjustments for changes in HbA1c (ESM Table 1). The importance of changes in body weight was confirmed by correlation analysis across treatment groups. The changes in body weight correlated with changes in hs-CRP (r=0.73, p<0.001), TNF-α (r=0.40, p=0.04) and leptin (r=0.74, p<0.001). Changes in the level of hs-CRP correlated with changes in leptin (r=0.63, p<0.001) and TNF-α (r=0.44, p=0.02) concentrations. There was also a correlation of borderline significance between changes in levels of TNF-α and leptin (r=0.34, p=0.08). There were no significant correlations between changes in HbA1c and changes in any of the adipokines. In this study of patients with type 2 diabetes, lifestyle intervention reduced levels of PAI-1, hs-CRP and TNF-α, while insulin therapy increased the levels of PAI-1, TNF-α and leptin despite a similar blood-glucose-lowering effect. A considerable part of these effects was linked to the intervention’s effect on body weight. Statistical adjustment for changes in BMI weakened the effect of treatment group on hs-CRP, TNF-α and leptin and showed that BMI change was an independent predictor for changes in the same adipokines during the intervention. These associations were confirmed by the close correlation between changes in body weight from baseline to 12 months and changes in hs-CRP, TNF-α and leptin in the same interval. Furthermore, in the ranges studied, the changes in the levels of adipokines were independent of the plasma glucose levels. In the group that received both lifestyle and insulin intervention, the levels of PAI-1 decreased despite an increase in body weight, indicating that lifestyle intervention can have a beneficial effect on PAI-1 beyond the changes in body weight. Another important finding is the considerable increase in leptin levels observed after the start of insulin treatment. Higher levels of leptin in insulin-treated type 2 diabetic subjects compared with patients on OHAs have previously been reported . However, for the first time, we present longitudinal data that seem to indicate that the main increase in leptin levels precedes the main weight increase during chronic insulin treatment. To the best of our knowledge, this is the first study that reports a direct, prospective comparison between lifestyle intervention and insulin treatment on the effect on important adipokines in type 2 diabetes. Our findings are mainly in accord with what could be expected from studies in non-diabetic individuals. Increased physical activity has shown beneficial effects on inflammatory markers in healthy individuals , in patients with chronic heart failure , and in patients with intermittent claudication . Furthermore, in 180 patients with the metabolic syndrome following a two-year lifestyle intervention programme, 4 kg of weight reduction resulted in a 1.1 mg/l median reduction in hs-CRP levels . The authors attributed their findings to the composition of the diet rather than to the energy balance and claimed that it was largely independent of the changes in body weight. Because the diet prescribed in our study was similar to the diet of their control group, the exercise part of the intervention may be responsible for the reductions in hs-CRP and body weight in our lifestyle group. In a similar study of 60 obese women performed earlier by the same group , the lifestyle intervention group reduced body weight by 14 kg and obtained the same reduction in hs-CRP (1.1 mg/l). However, in contrast to our findings an additional increase in the levels of adiponectin (2.7 μg/ml) was obtained. Recent studies have indicated that the most biological active form of adiponectin is the high and medium molecular weight adiponectin oligomers . Our analysis does not quantify the content of the different forms of adiponectin and this may be the reason why we do not observe a significant interaction. In a trial comparing the effect of two low-fat diets differing in carbohydrate:protein ratio in obese subjects with hyperinsulinaemia, a weight reduction of 2.9–4.1% resulted in a significant reduction of CRP at week 68 in both intervention groups . A possible confounding effect of other pharmacological agents than insulin in our study cannot be ruled out. Lipid-lowering and antihypertensive therapies were largely kept unchanged during the study, except for a few individuals who changed antihypertensive therapy. The patients in the L group continued their tablet treatment with SU and metformin, while the participants randomised to insulin treatment were taken off OHAs. Two subjects had their doses of metformin reduced, one from 2,000 to 1,500 mg/day and the other from 2,500 to 2,000 mg/day, and one subject had the dose of glibenklamid reduced from 10.5 to 7 mg/day, because of hypoglycaemic episodes resulting from the glucose-lowering effect of the achieved weight reduction and increased physical activity. In a study comparing insulin treatment in combination with either metformin or placebo , it was shown that metformin treatment was associated with a decrease in PAI-1 and other markers of endothelial dysfunction independently of changes in glycaemic control and body weight, without any effect on hs-CRP. Others have found that metformin treatment lowers both PAI-1 and CRP . In our study, however, we found a decrease in PAI-1 both in the lifestyle intervention group that continued metformin treatment and in the group that stopped metformin and combined lifestyle intervention with insulin treatment. Other studies have consistently reported significantly decreased PAI-1 levels following regular exercise and there is ample evidence that weight reduction reduces PAI-1 and tissue-type plasminogen activator antigen levels in non-diabetic subjects . Still there is a risk that stopping metformin in groups L+I and I may have contributed to the differences between these groups and group L at the end of the study. Decreased plasma levels of glucose might be expected to result in reduced transcription of the PAI-1 gene and increased fibrinolytic activity in vascular tissue . In one study  insulin therapy decreased plasma PAI-1 activity in patients with type 2 diabetes without changes in glycaemic control. In another study  insulin therapy resulted in greater reduction in plasma PAI-1 concentrations than did SU therapy. Different insulin regimens, different effects on body weight or differences in the patient characteristics may contribute to explain the discrepant findings. The mechanisms that regulate the levels of the different adipokines remain unclear. Synthesis of adipose tissue TNF-α and leptin could induce the production of hs-CRP, PAI-1 and other acute-phase reactants, thus contributing to the maintenance of a chronic low-grade inflammation state involved in the progression of obesity and its associated comorbidities. In a cross-sectional study  BMI, type 2 diabetes and adipose TNF-α mRNA levels were significant predictors of serum CRP levels. This is in line with our results, where change in BMI was an independent predictor of hs-CRP, TNF-α and leptin, and also the observed inter-correlations between changes in TNF-α and leptin and changes in hs-CRP. The insulin-treated group did not reach target levels of HbA1c and a more aggressive insulin treatment may have resulted in better glycaemic control and more favourable effects on the adipokines studied. On the other hand, the L group started out with a slightly lower HbA1c level and at the end of the intervention year HbA1c levels were similar in the intervention groups. Despite the limited number of participants in our study our findings indicate that improved glycaemic control through lifestyle-induced weight loss in type 2 diabetes may be more beneficial than lowering of HbA1c through insulin treatment. Given the importance of inflammatory and fibrinolytic processes in the pathogenesis of atherosclerotic vascular disease, our findings may contribute to an explanation of the marginal effects on cardiovascular outcomes in the intensively treated group in the UK Prospective Diabetes Study, where both SU and insulin treatments were accompanied by considerable weight increase. Thus lifestyle modification should be emphasised in the treatment of type 2 diabetes. We thank J. A. Falch and his staff at the Department of Medicine, Unit for Osteoporosis, Aker University Hospital for performing dual-energy X-ray absorptiometry scanning for estimation of body composition in all study participants. We would also like to thank the laboratory staff at the Hormone Laboratory at Aker University Hospital and Centre for Clinical Research at Ullevål Hospital for the analysis of the adipokines. The study was supported by research grants from the Norwegian Foundation for Health and Rehabilitation and The Norwegian Diabetes Association. Duality of interest The authors are not aware of any duality of interest.